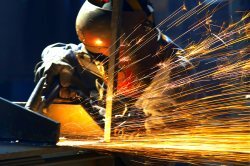 In its new report “The Benefits of Manufacturing Jobs,” the U.S. Commerce Department’s Economics and Statistics Administration has concluded that manufacturing workers are receiving a total hourly wage 17 percent higher than non-manufacturing workers. The report also found that the number of workers in manufacturing jobs with a high school diploma increased along with the number of workers with at least some college (over 50 percent). This increase in education among workers may be a result of the heightened reliance on science, technology, engineering, and math (STEM) within the manufacturing industries. What’s more, the Bureau of Labor Statistics has reported that employment within manufacturing industries has risen by almost half a million jobs since January 2010. Average hourly wages and salaries for manufacturing jobs are $29.75 and total compensation (including benefits) is $38.27. For non-manufacturing employees the numbers fall to $27.47 and $32.84 per hour. In 2011, 53 percent of manufacturing employees had at least some college education, up 10 percent since 1994. Nearly one-third of college-educated manufacturing employees has a STEM job; over 20 percent higher than those in non-manufacturing jobs.